Over 2,000 years ago, the comic playwright of ancient Athens, Aristophanes said: “Let each man exercise the art he knows!” We think he had it right. Yesterday, we were having lunch in Fiesole. It was balmy in the shade of the street-side cafe. 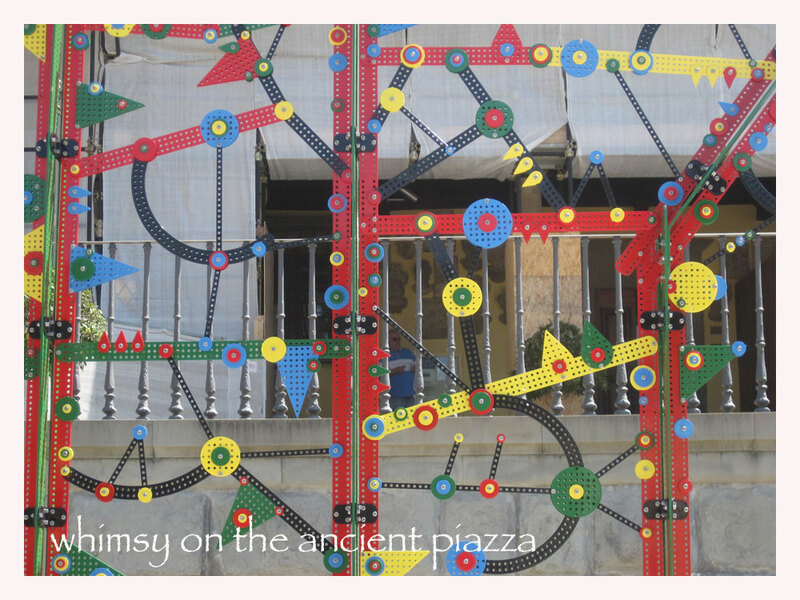 We were fascinated, watching the installation of a new sculpture, a colorful contraption, on Piazza Mino. Made of hundreds of small brightly enameled pieces, all fastened together into a collage; much like one of those erector set creations of 50 years ago—wheels, gears, nuts and bolts, angles and edges. The sun really made this one pop! It was playful and riveting. We liked it. Following the jagged red tile profile of the old rooftops, we saw another new project that had evidently just appeared on the horizon. 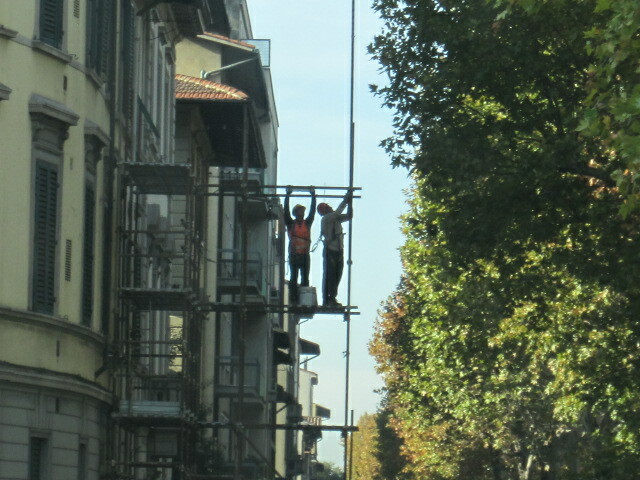 In Italy, like mushrooms, scaffoldings spring up almost overnight—signaling another restoration project. This one, however, was daring and different. The steel framework covered the campanile of the medieval church on the square. With a crenelated top that juts out beyond the tower, we reflected on the skill required to cover that sky-high profile. Whoever built that scaffolding, in all fairness, deserves the title artist/sculptor as well. The bell tower wrap reminded us of the artists Christo and his wife Jeanne-Claude. Together, they’ve spent a lifetime wrapping buildings, surrounding islands with color, and adorning landscapes with all sorts of props—all in the name of art. 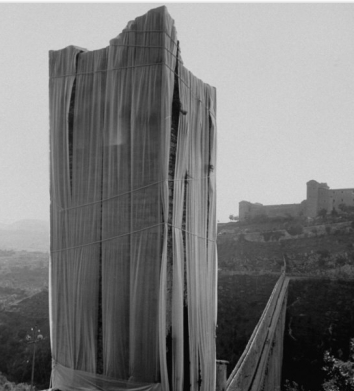 They actually wrapped a medieval tower in the Italian town of Spoleto back in the late 60s. 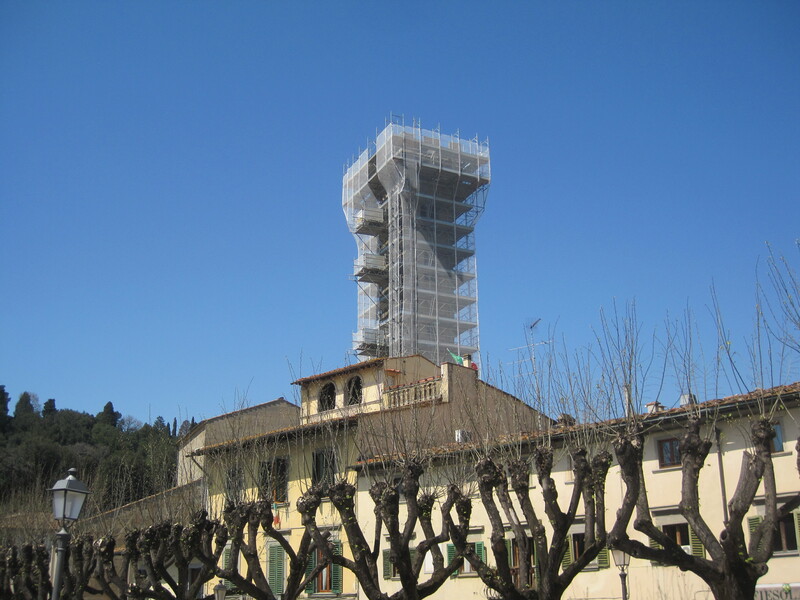 Their famous “wrappings,” resemble the new cloak of scaffolding in Fiesole. Spoleto also happens to be the home of a famous annual arts festival started in 1958, called Festival dei due Mondi, which means, Festival of the Two Worlds. It has become renowned for its three-week splash of Music, Theater, Dance, Sculpture and Art. We immediately began planning a visit. For us, art happens when the human spirit expresses itself, and that includes everything on display at Spoleto and more. Perhaps it’s time to include the art of “scaffolding” as a new accepted form of personal expression. After all, wherever and however man creates—art is born. Next Post: The Best of Italy!